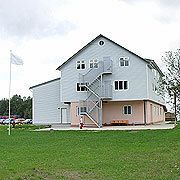 Three-storey building accommodates up to 120 guests. Dining room can seat up to 180 people. Each bedroom has bunks for 6 to 8 people. These rooms can also be used as classrooms. There are also 8 separate cabins which can sleep 8 to 10 people each. Since they are not winterized, they are only used in milder weather. 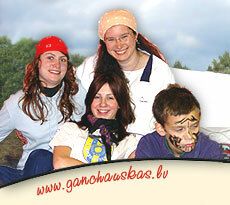 There are soccer and volleyball fields in Camp Ganchauskas. 12 metre high wall is a great place to test your climbing skills and strength. Very popular place. Used under instructor's supervision. What is a camp in the great outdoors without a campfire? A specially constructed campfire pit seats up to 100 people. Ideal for picnics. Monkey bars, swings, slides, etc. for kids to enjoy and have fun. Also a great mini-city for children. They like it. Adults do, too. Serves as dining room for summer cabins. Can seat up to 100 people. Includes: archery, trampolines, BMX bikes and other recreational equipment.